* Connection : double tab terminal for 5 mm clips. 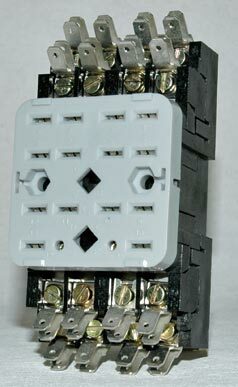 EVB2/CA-DL socket is a front wiring socket with clips for relays of CA series (2 complementary terminals, 14 and 15, compared to EVB1/CA-DL socket). See detailed indication regarding withdrawal in the technical support pages of this site. * Coding accessory (see details in our technical support pages).